Self-love comes first. If we earn our individual senses of self-respect, if our minds and hearts are in good shape and receive our ongoing loving care—if and only if we’re right with who we’re making of ourselves, then we can make the planet our home. For sure, I can’t be right with anyone else, indeed right with animal or tree or river, if I’m not in good inner shape. I must love myself enough to stay fit emotionally and mentally. This viewpoint perhaps seems either oversimplified or impossible or both. But it’s true! My responsibility to take care of myself hit me with full force the day after the 2016 presidential election. How odd, I thought, that my initial focus turned immediately to the essential need of taking care of myself. Curious, this awareness of my elemental need for spiritual sustenance when there was so much despair and suffering, both near and far. However, I was certain that self-care was my priority on this shocking, anxiety-inducing day. I can’t do anything positive ever, moving forward, unless I’m sound of mind and heart. Likewise, the oxygen mask goes first to airborne adults so that they can deliver quality assistance to the child or to the elderly. Sipping and savoring a mug of coffee and looking out the window on that grey day-after morning, I was reminded of an observation from a former student, after many years had passed, who had taken six (!) of my philosophy classes.“The one thing I learned for sure that stays with me is that the only thing I can change is me. Even if I want to work for bigger change, it’s me who needs to change first. That’s what all those classes meant to me.” Not a bad realization should there be but one! My restoration and rejuvenation must begin now, this day and for all the days that follow. I may feel akin to Humpty-Dumpty post-election, but I can put myself together again. Walking with a slow-trotting dog, following his wandering lead…indulging in the surround sound of silence…reading a good book, a trusty standby or recent gift…sending a birthday card...throwing a ball…making guacamole…dozing in front of the fireplace…listening to music of all kinds…saying “no thanks” sometimes and “sure, let’s” when the time is right. Breaking bread, leisurely, with people who stoke my soul…chatting with strangers as we stand in line…watching a movie uninterrupted, maybe twice. Yes, there's much work to be done, locally and nationally, in families and among friends. So I’ll ready myself, step out, get going, but stop to admire a pansy blooming in mid-December, too. What a lovely face that pansy presents to the world. Look a bit closer. 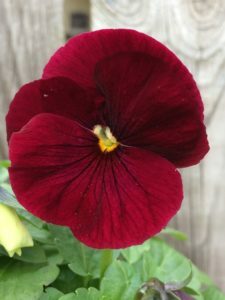 This pansy here and another there, so beautiful—savor the revivifying tonic. Ah, to be whole, or getting closer, and to love the world.